In the project ILUMASS (Integrated Land Use Modelling and Transportation System Simulation) seven research institutions in Germany developed an integrated, completely microscopic simulation model of land use, transport and environmental impacts in urban regions. For test purposes, S&W and the Institute of Spatial Planning of the University of Dortmund implemented the little ILUMASS model, a reduced version of the ILUMASS model in which the time-consuming microsimulation of traffic flows was replaced by the existing more aggregate transport model of the IRPUD model. Wegener, M. (2008): Multi-scale spatial models: linking macro and micro. Presentation at the Centre for Advanced Spatial Analysis, University College London, 9 January 2008. 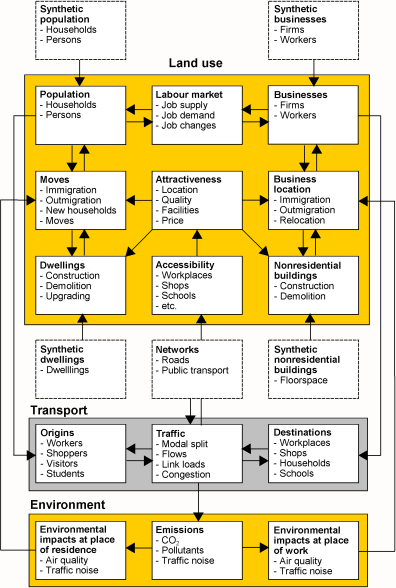 Moeckel, R., Schwarze, B., Spiekermann, K., Wegener, M. (2007): Microsimulation for integrated urban modelling. Proceedings of the 10th International Conference on Computers in Urban Planning and Urban Management (CUPUM 2007), Iguassu Falls, Brazil. Moeckel, R., Schwarze, B., Spiekermann, K., Wegener, M. (2007): Simulating interactions between land use, transport and environment. Proceedings of the 11th World Conference on Transport Research. Berkeley, CA: University of California at Berkeley. Wegener, M. (2011): The IRPUD Model. Working Paper 11/01. Dortmund: Spiekermann & Wegener Urban and Regional Research.